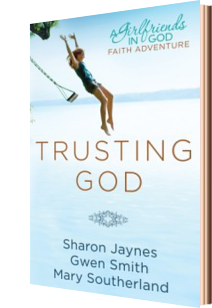 A few months ago, I joined the Blogging for Books from WaterBrook Multnomah Publishing Group and for my first book I chose Trusting God. It's described as a twelve-week devotional study, and the book is structured as such with weekly questions. And used with this structure it would be a fun, light, devotional for a group of friends to share and discuss weekly. I used it differently. Of course. I found that I dipped into the book and read the devotionals randomly or when a particular topic drew my interest that day. And I can happily report, that this unconventional approach worked beautifully as well. The daily devotionals take no more than a quick 5 minutes to read and are written in a breezy, easy to understand format, that is much like a talk with an understanding, compassionate friend. I highly recommend this book, either to share in a group format, or as an individual. Trusting God has a great deal of encouragement to offer.